I love Micro Cabin. While none of their games that I've played is a masterpiece, neither are any of them less than excellent. And there's a style to their work which sets it apart from typical JRPGs, in some cases feeling more American than Japanese. Probably the first thing you'll notice about this particular Micro Cabin game is what a strong demonstration it is of the 3DO's prowess. No, it doesn't do much with the console's then-vaunted FMV capabilities, containing only intro and ending FMVs, both pretty drab in quality. What it does is show off its 3D capabilities to an extent that is fairly startling. 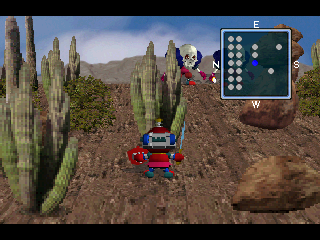 The playable characters look cutesy (as can be seen on the cover), but they're smoothly rendered, and the scenery and enemies are anything but cute. 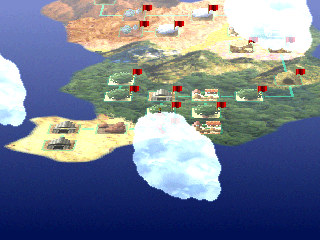 Each action in combat is accompanied by a slick animation (though you can turn animations off), the individual locations have cool touches like waves lapping at the shore, and there are even clouds passing over the world map! Underneath such graphic power and attention to detail, there is strong substance, too. While basically a Tactical RPG, it borrows a couple elements from dungeon crawling, and unlike every other Tactical RPG in history, it uses an over-the-shoulder 1st person perspective instead of an overhead view. This would be a major gaff if the usual large-scale battles were in store, but they're not. On each battle map, enemies are spread out in bands of 2-7, and approaching a band initiates a discrete encounter, like in a traditional RPG. While wandering during an encounter can draw other bands into the battle, in practice this won't happen unintentionally. Between encounters, your party moves as a single unit, and you can open treasure chests. It's unfortunate that Micro Cabin couldn't think of anything else for you to do, particularly since you aren't allowed to equip items on a battle map, which takes all the excitement out of obtaining a new item. But the unique approach to the battles is enough. Since you can see where your enemies are simply by opening the map (and there's also a handy mini-map in the corner, a la Slayer), you can choose which way your troops approach them, and in what formation. The right tactical approach can limit the enemy's ability to strike first, and even determine the outcome of an encounter. Another excellent twist is that menu options aren't just for magic users. Each character class has 1-3 moves to choose from, and a character can bear up to three classes at a time (though unless you take up grinding, it's best to have each character specialize in two classes). Each of the nine starting character classes can eventually be pomoted to one of two advanced classes, for a total of 18 advanced classes - a real boon to the replay value. And in another touch of the unusual, a character with remaining movement range can continue to move after attacking, allowing you to set up hit-and-run attacks. The game's main trouble is its lack of balance. Some character classes are essentially useless. For instance, the three knight classes are strong enough, but their limited mobility compounded by total lack of ranged attacks means that even when you put them in the front lines, they rarely get to attack. The spells wielded by the shaman classes can damage multiple enemies at once, but only take away a fraction of their HP. When the worthwhile characters are routinely scoring OHKOs, this makes it very hard for a shaman to get the kills he needs to gain EXP. And while the neptune class dominates the two underwater battles, the fact that it can only move one space at a time on dry land makes it useless everywhere else. 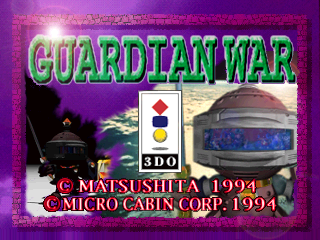 Then there's the odd fluctuations in the difficulty curve, one of many ways in which Guardian War is similar to Micro Cabin's Tactical RPG for the Saturn, Mystaria/Blazing Heroes. While these are bearable, they make the game a less elegant experience than it could have been. But though the game is unbalanced, the challenge in general is just about right, forcing you to think about each move without forcing you to bang your head against a wall. 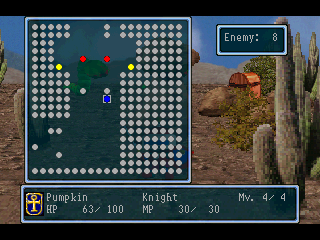 Combat is complicated by the presence of floor tiles which cause units standing on them - friendly or otherwise - to recover HP, lose HP, or even be prevented from casting spells, depending on the pattern of the tile. And for help getting through trouble spots, certain pairs of characters can use powerful combo attacks. There's certainly nothing wrong with this story, but I feel Micro Cabin lost an opportunity by not coming up with something more complete. The golems travel through a breathtaking variety of settings for combat - beaches, forests, shrines, volcanoes, and even the belly of a whale - and these would be more involving if there were more story behind what these places are, why you're traveling through them, and who the characters are making the journey. 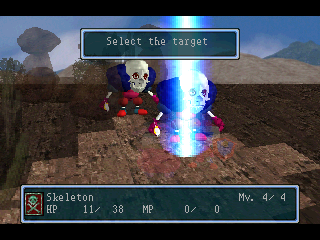 The 3DO's library may be known for experimental and bizarre titles, but Guardian War is a very solid meat-and-potatoes Tactical RPG, with enough twists in the formula to keep it from being generic. Gamers without a particular liking for RPGs will most likely find Guardian War too difficult and slow, but if RPGs are your bag than you should certainly give this one a try. I love this game too. 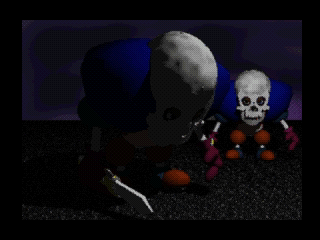 I think back in 1994/5 the graphics for this were startling, and the look and feel is very much post 16bit, new 32bit era. Any Japanese RPG that moved from Japan to Europe/USA prior to Final Fantasy 7 was a brave move. This is on my shortlist of 3DO games to delve into soon. The screenshots remind me of Guardian's Crusade for PlayStation, which I played for a while last month. Terrible title screen, though -- it has that cheap/cluttered look, can't put my finger on why, but it would've benefited from the attentions of a skilled graphic designer! goldenband wrote: This is on my shortlist of 3DO games to delve into soon. The screenshots remind me of Guardian's Crusade for PlayStation, which I played for a while last month. Oddly enough, the game has two title screens. Like this one any better? The first title screen is just for when the game is initially loading ... I think. Nice review btw. I forgot to comment on it earlier, but glad others bumped it. 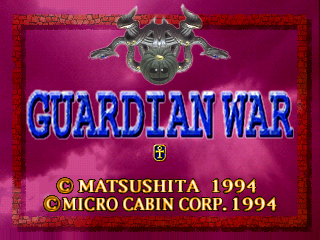 Guardian War is one of my favorite 3DO games ... in some ways I actually prefer it to Lucienne's Quest. I like the screenshots, they are very crisp. Did you use an emulator to capture them? Trev wrote: The first title screen is just for when the game is initially loading ... I think. Yeah, but it's still clearly a title screen of sorts. I wasn't sure which one to use with the review, but I went with the first one because I think it's a lot more representative of the game's style. Austin wrote: I like the screenshots, they are very crisp. Did you use an emulator to capture them? Yeah, good old 4DO. With a lot of emulators you have to open up a menu to take a screenshot, which makes it difficult to impossible to get a good snap. 4DO has those wonderful hotkeys, though, so getting good screenshots as easy as it gets. Seriously, 4DO is all kinds of awesome. In this case, though, I would have liked to be able to take screenshots from the 3DO itself, since then I'd have been able to use the saved games on my 3DO to get shots from deeper in the game. 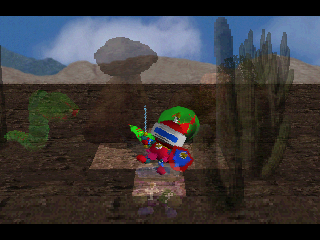 Unfortunately, emulators are my only option for taking screenshots. I like this one quite a bit. 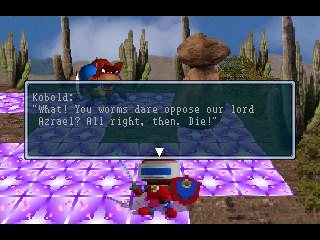 It's a slower paced Shining Force, but anything that plays like Shining Force is ok with me. I do wish there was more story to it. One thing I want to ask, is the 3DO fully capable of transparency? Some of the magic I've used in the game definitely looks like a real transparency and not a dither effect, but I'm playing over composite so I could be mistaken. zetastrike wrote: One thing I want to ask, is the 3DO fully capable of transparency? Some of the magic I've used in the game definitely looks like a real transparency and not a dither effect, but I'm playing over composite so I could be mistaken. I agree, I distinctly remember what looked like real transparencies while playing the game. And looking over my screenshots for the review, I see there are two good examples. First, on the world map, you can see cities and landscapes through the clouds. 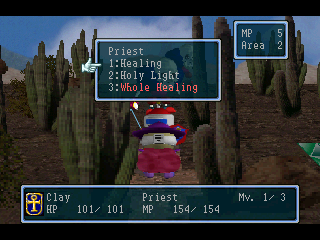 Second, in the shot with the Priest menu, you can see through Clay the priest to the ground ahead of him. I want to say that Ewhac commented on the 3DO's transparency capabilities (or lack thereof) in one of his videos, but I can't remember where. I'll post back here if I stumble upon it again. Another example to look at is The Need for Speed. The 3DO version has transparent shadows for the cars while the Saturn version doesn't.